As a China CNC Machining Service, So let's continue what we did last time. A small Aluminum Machining center is a machining center in which the table and the spindle are placed in parallel. The small machining center usually has three linear motion axes plus one table rotary axis. Small machining centers generally need to be in an environment below 30 degrees Celsius to work properly. Under normal circumstances, exhaust fans and air coolers are installed in the distribution box of small machining centers to ensure that the electronic components and central processing are working under constant temperature. If the temperature and humidity are too high, the component life of the control system will be reduced, resulting in an increase in the failure of the small machining center. When the humidity is increased, the dust will increase on the integrated circuit board and directly lead to failure of contact and short circuit. When using a small machining center, the customer cannot change the machine parameter setting of the machine at will, because these factory parameter settings are directly related to the dynamic characteristics of each part of the small machining center. Only the gap compensation parameter value can be set according to the actual situation. If you want to change the factory setting parameters, please contact the manufacturer and change the factory parameter settings under the guidance of the manufacturer's technician. 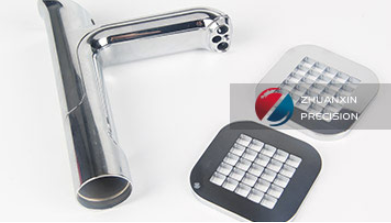 If you are interested in Aluminum Paint Machining, please sales002@zxmade.com.